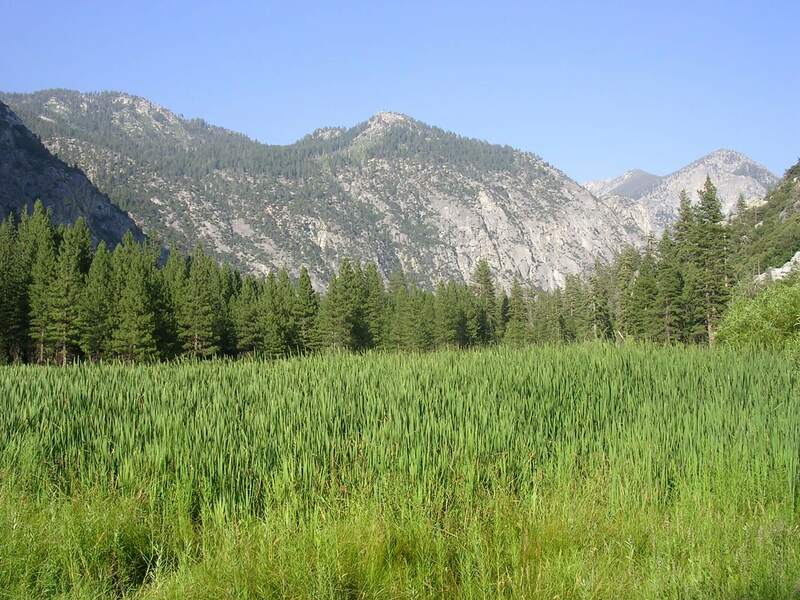 Stand in a lush meadow with grasses swaying gently in the breeze, surrounded by dramatic peaks rising up out of a U-shaped valley, such as at Kings Canyon National Park’s Zumwalt Meadow (photo above), and something remarkable happens. Cortisol levels and a protein enzyme, a-amylase, both markers of stress, go down. Positive emotions and attention go up, which further crowd out the distractor of stress, whose wont is for us to be in the two tenses we're not in, instead of the one we are. Maybe we ought to be spending more time outdoors? That’s what more and more studies are finding. The natural world is a kind of ambient medicine, an antidote to tension, pressures, and preoccupation, a restorative that helps the mind recover from nagging psychological demands and their physiological impacts on our bodies, and lets us taste some work-life balance. It’s a stress management strategy you can use even in the middle of the city. All you have to do is stroll in a park or some greenery. As an undergrad at Stanford, Gregory Bratman wanted to understand why urban dwellers and workers had less anxiety in green spaces. He had subjects in his study walk through a green parkway for 90 minutes while others ambled along a highway. Brain scans measured the state of their subgenual prefrontal cortex, home to brooding and obsessive thoughts, before and after. The folks who walked in the natural setting were found to have less ruminative thoughts that fuel stress and had, as a result, improved their mental health. The highway jaunt didn't have those benefits. With the growing amount of time spent inside staring at screens these days—which reduces attention and increases stress—there’s no doubt we could use the tonic of natural environments to help manage demands and prevent attention spans from shrinking to that of a gnat. It feels good to be in the natural world for a host of reasons. It overwhelms worries, uplifts spirits, and makes us want to put on our kid hat again. For centuries, a trip to natural springs or mountain lodges, the fresh-air cure, was the medical prescription for a host of maladies. Greenery, open spaces, bodies of water, towering ridges, and inspiring landscapes have a calming and therapeutic effect on humans, and no doubt the fact that they are where we come from has something to do with it. Researcher Roger Ulrich argues in his studies that natural environments resonate with us since they provided us with elements key to survival—such as water and spatial openness. Perhaps we feel we are back at home at some level. Certain natural features are particularly uplifting, such as bodies of water. There's some science behind it too. Air molecules in highly humidified environments retain negative ions, and humans seem to have better mood when in their midst. Ocean waves and especially waterfalls are hubs for negative air ions, which, unlike negative emotions, say some researchers, can elevate mood and function as an anti-depressant. Maybe that is part of the magic of surfing or watching vertical rivers plunge to earth. Wondering removes minds from self-preoccupation and ego and makes us realize our small bit part in something much larger. That gets us out of our self-obsessed heads, always a plus on the blood pressure front. Stephen and Rachel Kaplan developed a framework around the enhancing cognitive effects of being in nature they called Attention Restoration Theory. They found a progression of attentional states that nature helps encourage: a clearer head or concentration, mental fatigue recovery, fascination or interest, and reflection and restoration. Green settings help that mental reboot by sidelining worries and to-do's as attention shifts to scenes of non-threatening openness and beauty that command focus. How natural of a setting do you have to be in to get the restorative benefits of nature? Studies have found that walking in a green space, even a city park, is more therapeutic than walking in the concrete jungle and running outdoors is better at reducing negative emotions than on a treadmill. Alan Ewert and Yun Chang did a study zeroing in on the degree of restorative benefits of various kinds of natural and urban greenery settings. They measured the effect of a lake area surrounded by wilderness forest and hiking trails, a municipal park with walking paths, and an indoor recreational facility with a running track, treadmills and a weight room. The results showed that the wilderness lake had the highest levels of stress reduction, the least worries about demands, and the biggest increase in level of joy. The last element is a key one, since it no doubt accounts for the uptick in positive emotions that kick out negative and ruminative states in natural settings. Joy is one of the chief positive emotions, along with interest, contentment, and love, identified by Barbara Fredrickson at the University of North Carolina as emotions that broaden and build our psychological resources and serve as stress buffers. Fredrickson says joy helps us engage in enjoyments, and sets off the urge to play and be spontaneous—all participant actions that get us into the thick of experiences beyond the utilitarian that help us gratify core needs. Follow the green, and you can take advantage of one of Fredrickson's more nifty discoveries—the "undo effect." The joy, inspiration, beauty, and serenity of green space can put you into a state of mind where the positive emotions literally shut off any physiological symptoms of stress. Digestion starts up again. Blood pressure goes back down to normal. Heartbeat slows down. What stress would you like to undo today? Find the nearest park and head there on a break or the way home from work. You can write your own prescription. If you would like to learn more about my work-life balance and stress management programs for your team or organization, please click the button below for more details.